Source: London, J. (1904). The Sea-Wolf.New York, NY: Macmillan. The narrator of the Novel, Humphrey Van Weyden, finds himself in a very precarious situation before he is rescued by a passing sealing ship. Humphrey awakens to find himself aboard the Ghost, a seal-hunter headed for Japan. The cook, Thomas Mugridge, explains the current situation aboard ship. Humphrey meets the tyrannical Captain Larsen, and finds that his request to be released from the ship falls on deaf ears. Captain Larsen informs Hump of his new position aboard the Ghost, all the while ridiculing his weak appearance. Mugridge treats the new cabin boy harshly, ordering him around every chance he gets. An accident aboard the Ghost results in a new nickname for the narrator. "Hump" receives very little sympathy from the crew for his injuries. Hump receives his dried clothing, but notices that some valuably articles are now missing, resulting in an altercation with Mugridge. A misstep while performing his duties aboard ship, results in violence towards Hump. Hump informs Captain Larsen of his missing money, but is only chastised for his irresponsibility and later presented with some of the captains philosophy. Hump learns more and more about the design and purpose of the Ghost. Hump discusses Captain Larsen with a new acquaintance. An incident on board ship further exposes Hump to Captain Larsen's philosophy. As the Ghost catches speed, propelled by the trade winds, Hump takes in the natural beauty of the ocean. Captain Larsen explains more of his philosophy on life to Hump. Hump continues to analyze the enigma that is Captain Larsen. Hump witnesses a poker game between Captain Larsen and an intoxicated Mugridge, taking note of the quantity of gold in the pot. Captain Larsen refuses to honor Hump's claims to the gold, but later assigns Mugridge to perform extra duties while inviting Hump to eat at the captain's table. Hump has an extended philosophical discussion with Captain Larsen, while an enraged Mugridge continues to perform extra duties. An argument with Captain Larsen results in the continuation of Hump's duties as cabin boy. The situation between Mugridge and Hump finally comes to a head. The relationship between Captain Larsen and Hump continues to progress, as Larsen divulges more of his past. A discussion of life, nature, and existence with Captain Larsen ends in a rather strange act of violence towards Hump. A complaint by Johnson and his subsequent treatment results in an outbreak of violence throughout the ship. A recovered Mugridge returns to work as cook, relieving Hump of his extra duties. An altercation between Leach and Johansen results in friendship between Hump and Leach. Hump laments the absence of women aboard ship. Later that same night, Hump encounters a visibly dazed Harrison and a bloodied Captain Larsen aboard deck. Hump witnesses another incident of violence below deck. Following the failed mutiny, Hump remains in the sleeping quarters quietly listening to the disgruntled sailors before being called to Captain Larsen's cabin. Now having been promoted, Hump runs the ship with the assistance of Louis. Captain Larsen continues to make life on ship unpleasant for the mutinous sailors. Johnson and Leach bide their time while waiting for another opportunity to take out Captain Larsen. Leach, fearing that death is eminent, asks a favor of Hump. Ghost, having reached Japan, takes advantage of the migrating seal herds. Captain Larsen, Mugridge, and Hump, having remained on ship, attempt to reach the sealing ships before the approaching storm does. Captain Larsen evaluates his losses. After the passing of the storm, the Ghost surveys the area for lost ships and crew. Captain Larsen forcibly adopts new crew members, while continuing to terrify and mistreat his crew. 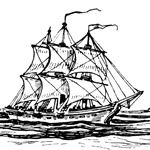 Johnson and Leach finally attempt an escape aboard a sealing boat, setting sail for Japan, the discovery of which, prompts pursuit by Captain Larsen. As the Ghost approaches a nearby boat, Hump prepares to intervene with violence if necessary. As the Ghost approaches another boat, Hump, having recognized Johnson and Leach, attempts to ensure clemency for the two sailors. After the storms dies down, Maud Brewster joins the sailors for the evening meal, where she makes a request of Captain Larsen. Hump and Maud, having recognized each other as peers, engage in conversation as an agitated Captain Laren looks on. Captain Larsen's frustration is taken out on Mugridge, who is greatly injured in the process. After a discussion of Captain Larsen's cruel behavior towards the crew, Hump and Maud come to an understanding. The Ghost continues hunting seals as the weather and seas grow increasingly rough. Hump's admiration and affection for Maud continues to grow, even as he becomes increasingly aware of Captain Larsen's growing lust towards the young woman. Captain Larsen's, having become more possesive of Maud, excludes the crew from his table. Interference by the captain's brother, Death, results in monetary losses for the Ghost. After another incident with the Macedonia, the crew of the Ghost engage the intervening boats, prompting Death to give chase to his brother's ship. Hump, assisted by Oofty-Oofty, tends to the wounded sailors. Hump, Captain Larson, and Maud discuss temptation and the soul over dinner. Hump attempts to intervene after encountering Larson and Maude in outside his cabin. Overcome by pain, Captain Larsen collapses. Hump, feeling that he can no longer stay on board the Ghost, gathers supplies and sets his course for Japan accompanied by Maud. As they make their escape, Hump instructs Maud on the finer aspects of sailing and steering. Hump, although concerned with the nature of their situation, remains unafraid. After their extended time at sea, Maud and Hump finally reach land. Now on "Endeavor Island", Hump and Maud are determined to make the best of the situation. In order to weather the elements, Hump and Maud make use of their available materials. Hump continues to create a measure of comfort for himself and Maud. Hump is alarmed to discover the empty Ghost beached on the shore, but takes advantage of the situation to gather much needed supplies. Hump encounters a disheveled Larsen, who proceeds to tell him of the events that followed his escape from Ghost. A week passes without any interaction with Captain Larson, prompting Maud to fear for the captain's health. After a brief, but unpleasant encounter with the captain, Maud and Hump take turns keeping watch. Hump and Maud, having considered all their options, devise a plan that will allow them to escape the island. Captain Larsen lets his true intentions be known. Hump and Maud remain cautious with the unpredictable captain so close by. As Hump and Maud attempt to repair the damage vessel, a much diminished Larsen attempts to undermine their efforts. Hump and Maud continue to salvage the vessel, while foiling a would be saboteur. Hump and Maud continue their work on the Ghost, as Larsen's health takes another downturn. Hump and Maud complete the final rigging of the ship as the ailing captain's health continues to decline. The Ghost, sets sail one last time, headed towards the coast of Japan. After a period of rough weather, the exhausted couple find themselves in more familiar seas. Hump and Maud finally admit their true feelings. London, Jack. The Sea-Wolf. Lit2Go Edition. 1904. Web. <https://etc.usf.edu/lit2go/153/the-sea-wolf/>. April 19, 2019. Jack London, The Sea-Wolf, Li2Go edition, (1904), accessed April 19, 2019, https://etc.usf.edu/lit2go/153/the-sea-wolf/.